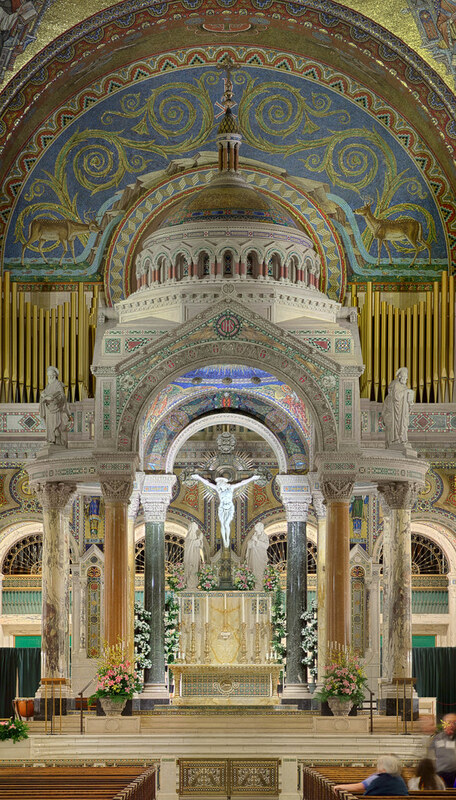 This is the high altar of the Cathedral Basilica of Saint Louis, decorated for Easter. Photo taken on Wednesday, during a guided tour, which is why blurry people are at the bottom right. This image is originally six by three feet in size and is a composite of 75 separate photographs. Clicking the image will take you to Flickr, and there you can select "ALL SIZES" to see the original large image. You can clearly see individual mosaic tiles. The image is somewhat flawed, and needs retouching, but I hope that everyone otherwise enjoys it! I have an even larger image, showing the entire sanctuary, and part of the main dome and transepts, but it is four times larger than this photo, and Flickr won't let me upload it.